作者：Audrey Cheng, Kelvin Chen etc. 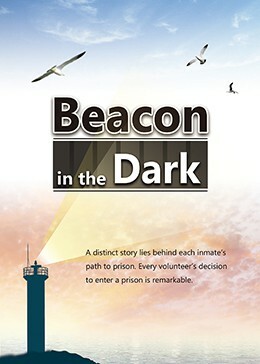 Beacon in the Dark is a collection of inspirational and uplifting life stories about individuals who are, or were incarcerated but overcame rejections, doubts, guilt, and anger through the guidance of Buddha’s teachings, and help from volunteers who gave unconditional trust, love and support. Behind each prisoner, there is a unique story of being incarcerated, just as each volunteer goes through a journey of soul searching for the purpose of serving the inmates. In this book, readers will read about the struggles these individuals faced in prison or in society after they were released. During their journey of reform, it was not always smooth sailing. It was not free of doubt, rejections, or frustration, it was similar to what they had experienced prior to being incarcerated or during their sentence. However, because of the practice of Buddha’s teachings, instead of impulsive responses with violent actions, they were able to let go of their anger, endure rejections and persevere through frustrations. They are now able to view the world through a clearer lens, and to perceive life with wisdom. There is the stigma of having been in prison—few employers are willing to take on an ex-con, and it is near impossible to get any insurance for anything. Returning to society after being incarcerated for a number of years is not easy. The most effective way to assist individuals in staying out of prison once they are released is to properly prepare them before they are released. Everybody wins when a released inmate stays away from crime and re-incarceration. Preparing inmates to live moral, legal, and ethical lives after they are released is a great investment in all aspects. The teachings within the book Jing Si Aphorisms were referred to constantly within these stories. The book Jing Si Aphorisms is a collection of Dharma Master Cheng Yen’s discourse of Buddha’s teachings in plain and simple text. Jing Si Aphorisms transcend racial and religious barriers. They promote heart-to-heart dialogues. They have touched the hearts of all walks of life, and helped them to regain their footing, hope in life, and dignity. It takes a village to accept, love and support those re-entering society from being re-incarcerated. It also takes daily practice of Buddha’s teachings to cleanse our hearts, to foster a harmonious society and to create a world free of disasters. One by one, I started reading the Tzu Chi volunteers’ reports about the history of prison care. Eventually, this history became known to more and more people. The story of how it all began dates back to 1993. The volunteers at the Tzu ChiNew Yorkoffice received a letter with $100 check from an inmate at the New York State Jail. Since then Tzu Chi volunteers from around theUShave spread their love and care to prisoners inAmericafor more than 20 years. Eventually, we decided to start a study group in the prison nearLas Vegas. The volunteers who excitedly participated in the training, Care for the Prisoners, retracted when they realized that spreading love and care to inmates was not cooking and sharing vegetarian food with the inmates but actually involved talking with them inside of the prison walls. This wrecking ball scared the volunteers who were not too fluent in English. Another issue was the much fewer number of male volunteers to female volunteers within Tzu Chi, but especially in Tzu Chi Las Vegas. Fortunately, Kelvin Chen and Johan Alwall from the Tzu Chi US headquarters came to support this project. Together with local volunteer Ker Lin, they were the main pillars for the study group in prison. Kenny (Alias), a former inmate, has been one of the attendees of the study group in the CCDC-North Valley Complex. When Kenny made his first visit to theTzuChiServiceCenterinLas Vegas, he did not recognize me at first as all the Tzu Chi sisters were wearing similar hairstyles and the same uniforms. After having a long talk with Kenny, I learned that the short speech I gave on vegetarianism inspired Kenny to make a commitment to be a vegetarian and to live as a vegetarian the rest of his life. Eventually, theClarkCountyDetentionCenteraccommodated inmates who requested vegetarian meals. This turned out to be a serendipitous reward for our Dharma team. Upon speaking with Kenny, we were surprised to learn that there were so many people who, when released, did not know how to use social resources. Those ex-offenders who had no relatives and friends end up living on the streets. They were not well informed regarding halfway houses and charity organizations that could help them with food and shelter upon their release. As a result, they live in hardship and suffer from the elements and hunger unnecessarily, driving some of them to madness... all because they did not ask for the information. What kind of people “do not know” or cannot ask for the relevant information? Unsociable, benumbed, unpopular or insane, these kinds of people are prevalent in prisons. I realized that if I had not participated in these jail projects, I might have had outlandish ideas about the relationship between people in the prison. Today, the answer is there. Sometimes, the answer is only one step away, yet, this one step to most of us, is likened to thousands of miles away for a former inmate. When Kenny crossed the low tide of his life and came to Tzu Chi, he began to serve as a volunteer for community service. In order to participate in the free dental clinic, he was taken to the pharmacy to test for tuberculosis. During the waiting time for his examination, Kenny carefully initiated a conversation. We noticed that Kenny had done some homework in advance on the subject. Each question he asked was related to Buddhism. Sitting down, Kenny placed his hands flat on his knees, like a student in primary school who was waiting for a teacher to give him a report card. Several volunteers felt sad that Kenny did not get along very well with others upon his release from jail. In an effort to keep him company and help him get through this hard time, I bought a birthday cake as a surprise to celebrate Kenny’s birthday. In addition, to help him fulfill his dream of taking care of the homeless, I assisted him in doing laundry for them. Having worked in the Casinos for almost 20 years, my work schedule demands a great deal of my time. For Kenny, I put down my self-centered concerns and washed the sticky and dirty clothes for the homeless. One day, I was invited by Kenny to visit the homeless service center where he proudly showed me the computer security system he designed for them. Spontaneously, he invited me to go see his dormitory. At that moment, a few warning bells sounded in my head. I wanted to say no but I thought that my refusal might be taken as a lack of trust in him and that could hurt our Dharma team’s relationship with him. I followed him up the steps one by one, struggling with an unknown fate toward the place where Kenny resided. Upon entering, light from the attic exposed the deplorable conditions in which Kenny lived. There was a broken window, the carpet shoddy and torn, simple furniture and a piece of thin quilt. My heart was broken and ashamed for my earlier concerns. After several interactions with Kenny, he finally felt comfortable, opened his mind and slowly told us his story. There was a dental outreach one day and it was raining. Kenny had planned to walk by himself to where the dental outreach was to be held. I decided to offer him a ride and pick him up. Upon our arrival at the clinic, the rain became a downpour and we were trapped in the car until it subsided. Kenny suddenly asked me if I had ever hurt anybody before. I shook my head and said “no.” Kenny said quietly: “You are so lucky.” The wind and rain were violently beating on the windows of the car; yet the silence in the car was suffocating. I could feel that Kenny’s heart was crying out for help. As the rain continued, Kenny said he wanted to have a normal life and hoped to find someone that would accompany him through the thorny road of his future and to assist him in successfully returning to the outside world. I think what Kenny shared is the same hope as most inmates upon their release! Dear friends, did you hear their calls? Maybe someone is waiting in the corner of a cell in the depths of a prison, waiting in the most crowded but loneliest place, waiting for you to get close to him to show you care. Please join us. Let’s work together to help these people crying out for help. In a rundown building inWest Philadelphia, on a20”TV tube, I watched, with amazement and great interest, a commercial by a charity organization soliciting donations to help poor children around the world. That was 1974, only a few days after my arrival in theUnited States. I was a poor graduate student, with barely enough to feed myself and having absolutely no time to think of anything else besides my studies. For the first time in my life, I realized that there were charity organizations through which people who had enough could help people who had less. I vowed then that one day I would participate. In 1995, 21 years later, I walked into the Tzu ChiUSheadquarters in theLos Angelesarea and joined as a volunteer. By then I had plenty, and it was time for me to help others. I had attained a doctorate, worked for many years in a high paying globetrotting career, started my own company, and lived a happy family life with two children headed to Harvard. I said to myself, if not me, who else should help the needy? I am fortunate to be given the opportunity to establish the Chuan Fong Prison Outreach Project, the first comprehensive, coordinated effort by Tzu Chi to introduce Master Cheng Yen’s Jing Si Aphorisms and her concept of “giving without the expectation of return” to inmates across the United States. In December 2013, armed with the initial mailing list of 450 inmates supplied by the Chuang Yen Monastery in upstateNew York, we mailed each inmate the Jing Si Aphorisms book and the Tzu Chi USA Journal. The response was tremendous. Letters from the inmates began to flood in. We can see from their letters that, what we were offering—the news of charitable acts of unconditional giving by Tzu Chi volunteers reported in the Journal, and the spiritual guidance behind such actions clearly and simply explained in the Jing Si Aphorisms book—were exactly what the inmates needed. We assembled a team of writers to reply to each one of the letters individually, writing with compassion to tell them the Tzu Chi story, describing the “no-work no-meal” work ethic of our Master and her monastics, and sending them Buddha images and other Buddhist reading materials upon request. As of August 2018, we have grown the mailing list, all by word of mouth, to well over a thousand recipients. We have individually replied to over 1,500 letters. Many inmates who corresponded with us have been released, no doubt to a strengthened second chance at life. Some have even volunteered with Tzu Chi in various released locations. In addition to corresponding with inmates across the country, the Chuan Fong team has also supported many local prison visitation projects. We have provided expertise to help set up the initial visits, such as inLas VegasandHouston, as well as support established programs, such as inSeattle. You will read many articles regarding these visits and their amazing results. I hope by reading this book, you will appreciate the importance of Tzu Chi’s prison outreach project, the positive impact it makes on inmates’ lives, and be inspired by the selfless volunteers, most of them women, who have ventured into this dark corner of the world to provide a guiding light to those who have been discarded by society, and many even by their own families. May all be alleviated from suffering and causes of suffering. Copyright © Tzu Chi Culture and Communication Foundation. All rights reserved.